Arsenal’s 23 match unbeaten run came to an end last weekend with a 3-2 loss away to Southampton. However, they have now lost another game, 2-0 at home to Tottenham in the League cup, one that will feel more aggrieved after all it came against their sworn enemy. On Saturday afternoon, they have a chance of resuming normal duty against a Burnely side that they have not lost to in any of their last 10 meetings. Arsenal’s defensive crisis looks set to continue for the visit of Burnley, with Rob Holding, Hector Bellerin and Konstantinos Mavropanos all sidelined. Shkodran Mustafi and Henrikh Mkhitaryan are also ruled out, but Sead Kolasinac will be assessed and Sokratis is available after suspension. Burnley winger Aaron Lennon has had a knee operation, which will keep him out until the New Year. Johann Berg Gudmundsson and Robbie Brady could be fit after injuries. Arsenal are unbeaten in their past 10 matches against Burnley, winning nine and conceding just four goals. Burnley have lost all six competitive fixtures at the Emirates by an aggregate score of 18-3. The Clarets last won away in this fixture in 1974 – they have lost the subsequent seven matches. Arsenal sustained a first defeat in 15 Premier League games at Southampton last time out (W10, D4). They have lost just two of their 18 home Premier League games in 2018, with both defeats coming against Manchester City. Arsenal could lose consecutive Premier League fixtures for the first time since the opening two games of the season. They have won their last 27 home league matches against sides in the relegation zone since a 4-4 draw with Tottenham in 2008. The Gunners have not lost at home to a team in the bottom three for 11 years, a 1-0 loss to West Ham. They have not led at half-time in any of their 17 Premier League games this season (level in 13 and behind in four). Unai Emery has made a league-high 15 substitutions before the start of the second half. Bournemouth forward Callum Wilson should be fit after suffering no ill effects from his midweek comeback from a hamstring injury. Tyrone Mings is expected to overcome a hip injury but Captain Simon Francis is doubtful with an ongoing groin problem. Brighton remain without Shane Duffy, who is completing a three-match ban. Jose Izquierdo is still sidelined with a knee injury while fellow winger Alireza Jahanbakhsh remains out with a hamstring problem. Bournemouth are unbeaten in nine meetings with Brighton in all competitions (W5, D4). Brighton’s only win in their past 11 away games against Bournemouth was 2-0 in October 2007 (D2, L8). Chelsea have won their last two league games since the 2-1 loss away to Wolves a few weeks ago. Mauricio Sarri and his boys are now fourth but can temporarily go third as Spurs play on Sunday. Against Leicester, they come up against a side is struggling of late, winless in three whilst losing the last two. Chelsea’s Alvaro Morata is back in training after a knee injury but head coach Maurizio Sarri could again choose to use Eden Hazard as a false nine. Andreas Christensen is out with a minor hamstring problem. Leicester forward Jamie Vardy should return from the groin injury that kept him out of the midweek League Cup exit. Ben Chilwell could also play after a two-match absence with a knee injury but Wilfred Ndidi is a doubt because of a similar problem. Chelsea are unbeaten in their last seven meetings with Leicester in all competitions (W5, D2). Leicester’s last win at Stamford Bridge was back in September 2000, when goals from Muzzy Izzet and Stan Collymore gave them a 2-0 victory. Huddersfield welcome back striker Steve Mounie following his three-game ban. Rajiv van La Para returned to training this week after a back strain but Aaron Mooy, Danny Williams, Tommy Smith and Abdelhamid Sabiri are all still out. Southampton have no fresh injury concerns and hope several players will be available to return. Jack Stephens, Cedric Soares, Mario Lemina, Nathan Redmond and Michael Obafemi all face fitness tests, but Ryan Bertrand is a certain non-starter. Both encounters last season ended level, including a goalless draw at the John Smith’s Stadium in August 2017. Southampton have won five and lost two of their last nine matches against Huddersfield in all competitions. However, Huddersfield are unbeaten in their past three home games against Saints, winning two of them. Man City will have to spend Christmas in second place after falling four points behind leaders Liverpool who defeated Wolves 2-0 on Friday night. It is not ideal for the Citizens but will have to play catch up and first on the agenda is a Palace side that has not won away to City in 28 years. Manchester City’s Kevin De Bruyne and Sergio Aguero have shown no ill-effects from starting in the Carabao Cup on Wednesday after lengthy injuries. Danilo is available once again but David Silva, Vincent Kompany and Benjamin Mendy are all still absent. Crystal Palace will recall Wilfried Zaha and James Tomkins, who were both suspended last week. Martin Kelly has a muscle injury and joins Wayne Hennessey on the sidelines, while Cheikhou Kouyate is doubtful. Manchester City are unbeaten in eight matches against Palace and had won seven in a row prior to a goalless away draw last season. City are unbeaten in 13 home meetings in all competitions, winning 10. The Eagles have lost 5-0 on each of their last two trips to the Etihad Stadium. They have lost all six Premier League matches at the venue by an aggregate score of 21-1. Manchester City have won 27 and lost just three of their 34 Premier League fixtures in 2018, scoring 93 goals. They are vying to win their opening 10 Premier League home games of a season for the third time. The feat has only been achieved on five occasions in total. City have won 15 successive Saturday 3pm kick-offs by an aggregate score of 57-7. Pep Guardiola’s side have scored 33 home league goals this season, 14 more than any other club. They have scored a league-high eight goals in the opening 15 minutes of their games. However, City have kept only one clean sheet in their last seven Premier League matches. Newcastle welcome back defender DeAndre Yedlin from suspension, while Federico Fernandez is available following a calf injury. Jonjo Shelvey’s thigh problem will be assessed but Ciaran Clark has been ruled out with an ankle injury. Frank Anguissa is still sidelined for Fulham, but Ryan Sessegnon is expected to return from a groin issue on Boxing Day against Wolves. Stefan Johansen and Aleksandar Mitrovic are one booking away from suspension. Newcastle could lose four consecutive matches versus Fulham for the first time since 1982. The Cottagers are vying to win consecutive league away matches against Newcastle for just the second time. The last seven Premier League meetings have ended in a home victory, while four of the last five fixtures have ended 1-0. Watford have won four of their last seven Premier League games against West Ham (D1, L2). There has not been a draw in the 11 top-flight meetings between the sides at West Ham. Jack Wilshere will again be absent with the ankle injury that has caused him to miss West Ham’s last three matches. Forward Lucas Perez could return from a foot problem but the Hammers are still without several injured key players, including Marko Arnautovic, Andriy Yarmolenko and Manuel Lanzini. Watford midfielder Etienne Capoue will return after a three-match ban. However, Andre Gray, Will Hughes, Adalberto Penaranda, and Sebastian Prodl remain sidelined with injury. West Ham have won four straight league games. They last won five in a row in 2006. They are also aiming to win three consecutive Premier League matches at the London Stadium for the first time. 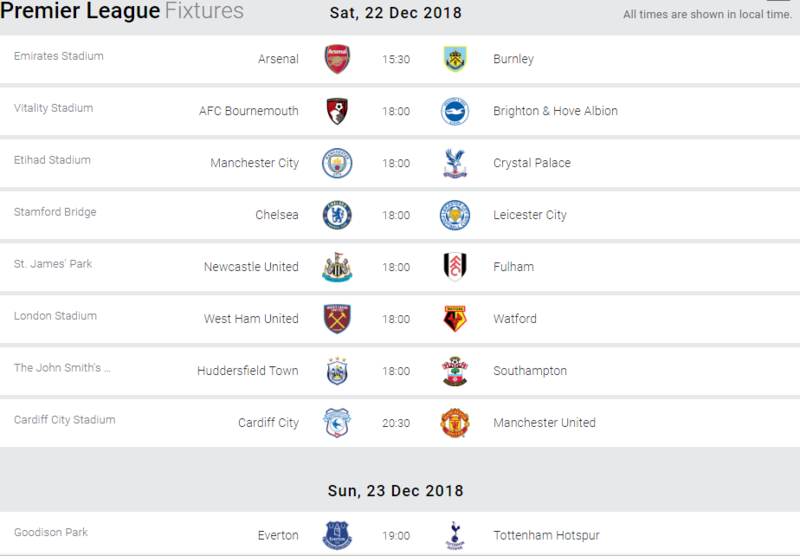 The Hammers have won four of their past six league fixtures at home, scoring at least three goals in each victory but failing to score in the two defeats. Man United start life under former Old Trafford hero, Ole Gunner Solskjaer away to to his only former Premier League club managed-Cardiff City. The Norwegian replaced Jose Mourinho on Wednesday and is tasked with trying to restore order and pride at the most successful club in England. Meanwhile, as Cardiff aim for their fourth home win on the spin, Neil Warnock will be pondering whether or not this is a good or a bad time to welcome the Manchester United juggernaut into town. Cardiff left-back Joe Bennett has not trained this week because of a hip problem and is doubtful for this game. A couple of unnamed players are also nursing “little niggles”, according to manager Neil Warnock. Manchester United are set to be without Romelu Lukaku, who has reportedly been given compassionate leave. Alexis Sanchez remains absent with a hamstring problem, while Chris Smalling, who was injured in the warm-up at Liverpool, is a doubt. New caretaker manager Ole Gunnar Solskjaer must decide whether to recall midfielder Paul Pogba and forward Anthony Martial, both of whom were substitutes in the defeat at Anfield. It is 58 years since Cardiff beat Manchester United, a 3-0 win in the top flight in November 1960. The Red Devils have won five of the subsequent seven meetings. The only previous encounter at the Cardiff City Stadium was a 2-2 draw in November 2013. Key Everton players Richarlison and Andre Gomes are fit to face Spurs. The pair were both forced to miss training sessions this week with illness, but will both be in the squad on Sunday. Midfielder Idrissa Gana Gueye missed last week’s defeat at Manchester City with a groin injury and faces a late fitness test. Meanwhile, Spurs striker Harry Kane is likely to return to the visitors’ starting line-up at Goodison Park after missing a training session on Tuesday with flu. However, the likes of Serge Aurier, Mousa Dembele, Eric Dier, Jan Vertonghen and Victor Wanyama are all out injured, although Davinson Sanchez may feature having recovered from injury. Everton are winless in their last 11 Premier League matches against Tottenham Hotspur (D5 L6). The Toffees’ last league victory over Spurs came back in December 2012 at Goodison Park (2-1). Spurs have won more games against Everton (25) than they have versus any other team in the Premier League. Everton are winless in their last 22 games against ‘big six’ opposition (D6 L16) since beating Man City 4-0 in January 2017. Everton are unbeaten in their last six home league games, winning four and drawing two. Spurs haven’t drawn any of their 17 league games this season – only Bolton in 2011/12 (18) have had a longer wait without a draw from the start of a Premier League campaign. Tottenham have won eight of their 10 away Premier League games this season, already more than they’d won in 20 of their previous 26 completed seasons in the competition. This will be just Tottenham’s third Sunday Premier League game this season – they’ve lost their previous two so far (vs Watford and Arsenal).